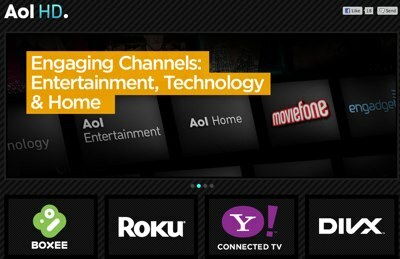 AOL has launched AOL HD, a dedicated video service that will deliver HD video to views on connected TV platforms including Boxee, Roku and Yahoo! Connected TV. AOL HD features three main channels of AOL Huffington Post Media Group content: entertainment, technology and home. Each channel features content from properties including Moviefone, Engadget and HuffPost Entertainment. Additional content will include cooking videos from celebrity chefs, as well as AOL Music’s full CD Listening Party (CDLP) audio content, which allows users to listen to free previews of entire albums before they’re released. AOL will add to the three channel lineup with new video channels and content, including casual games, later in 2011.